International Electrotechnical Commission (IEC) standards are by nature extensive because they have to cover all types of equipment and technical solutions. While they must be adhered to, they are not all that helpful in terms of explaining how best to comply. Schneider Electric wants to help fill that void. Our free 2018 Electrical Installation Guide is intended to help electrical engineers who need to design, select, install, inspect or maintain low-voltage electrical equipment in compliance with IEC standards. The guide is intended to be a working handbook that answers the same question – “Which technical solution will guarantee that all relevant safety rules are met?” – for a variety of circumstances and applications. It’s targeted at electrical professionals working in commercial, industrial, or domestic electrical installations, including consulting engineers, specifiers, designers, contractors, panel builders, facility managers, electrical engineering students and teachers, as well as people involved in standardization, certification, or inspection of these electrical installations. 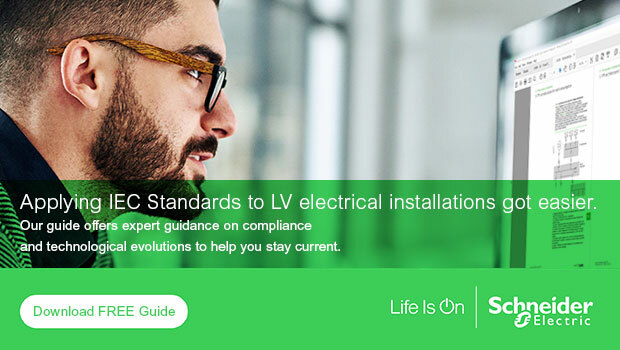 The guide was written by Schneider Electric’s most talented electrical distribution experts, who understand how to translate the technical language contained in IEC standards to practical installations in the field. We created this revised edition to reflect the most up-to-date and relevant information, including two deeply refreshed chapters including brand new contents. One is on solar energy production for self-consumption, meaning facilities that consume energy as it’s being produced. This chapter reflects the fact that photovoltaic (PV) system production is booming worldwide, and is intended to help electrical professionals design properly building electrical installations integrating PV production . It delves into how to size the system, what equipment is required, how to integrate PV into existing electrical distribution systems and more. The chapter includes expert advice on typical PV architectures and state-of-the-art sizing guidelines. The other renewed chapter provides advice on protection against electric shocks and electrical fires. It covers the various types of protection required by the IEC standards, including basic and fault protection, and advanced protection with high-sensitivity residual current devices (RCDs). You’ll also learn about proper implementation of the different electrical installation earthing schemes (TT, TN or IT), as well as the different protection measures against electrical fire risks, including up-to-date contents on Arc Fault Detection Devices (AFDD). In all, the 2018 Electrical Installation Guide has 17 chapters covering topics ranging from connecting to medium and low-voltage distribution networks and sizing of conductors to energy efficiency and overvoltage protection. Click here to download it now.